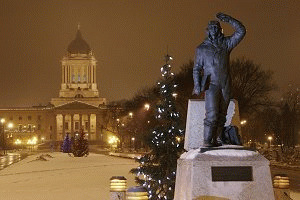 The city of Winnipeg, Manitoba's capital, is renowned across the country as a cultural Mecca. Despite its size and geographical location, the city boasts an astonishingly large number of renowned arts organizations such as the Royal Winnipeg Ballet, Manitoba Theatre Centre, Prairie Theatre Exchange, Winnipeg Contemporary Dancers, Winnipeg Symphony Orchestra, and Manitoba Opera, among others. The city's rich history is rooted in the fur trade of the early 19th Century. The downtown 'Forks' area was Winnipeg's original birthplace: a place of Aboriginal trade and social activity. Today, this is a busy area featuring dining, shopping, fresh food, clothing and crafts in two refurbished brick buildings at the forks of the Red and Assiniboine rivers. Nearby river walks and winter skating make the spot a popular recreation site year-round. The Forks is also home to Tourism Winnipeg, and the Manitoba Children's Museum. Winnipeg's diversity shines through in its neighborhoods: The Warehouse/ Exchange district, located directly downtown, consists of old warehouses with terra cotta and cut stone exteriors, and acts as the heart of the city's cultural life. City Hall, the Centennial Concert Hall, and several theatres are all located in this district. Check out St. Boniface, the francophone neighborhood of Winnipeg, home to the annual Festival du Voyageur (Canada's largest winter festival!) as well as the majestic St. Boniface Cathedral. Winnipeg's north end has developed from a community built around railway tracks to one of parks, festivals, and a strong identity. Stroll through Winnipeg's famous legislative building downtown, and check out the marble and stone architecture, famous paintings, as well as the famous 'Golden Boy', Manitoba's symbol. For some fresh air, head to Assiniboine Park, where you will enjoy bridges, paths, ponds, a zoo, a conservatory, and summer concerts in the park. Book accommodations in Winnipeg Manitoba and discover why so many are proud to call this prairie city home.